Windsor rocking chairs were named after Windsor, the English town where they were first crafted in the early 1700s. They were straight Windsor chairs to which rockers had been added. By 1750, Windsor chairs and rockers were being manufactured in America. They were available in many styles and are still popular today. 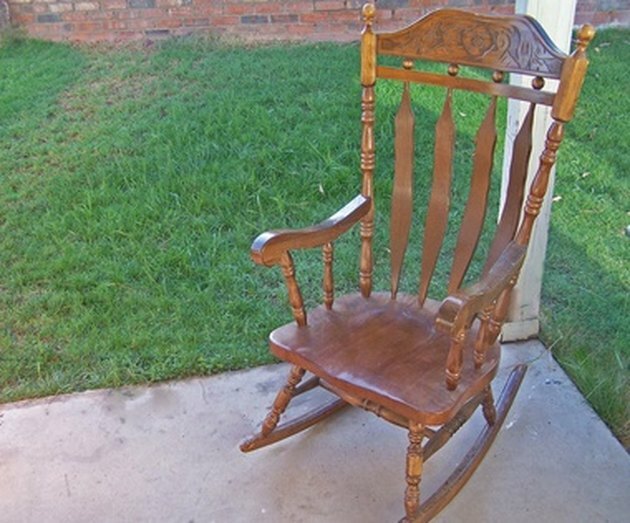 An arrow-back Windsor rocking chair with flattened spindles. Research Windsor rocking chairs. Before you can tell the difference between an old Windsor rocker and a more contemporary one, it is important to do your homework. Study books like "The Windsor Style in America," by Charles Santore. If possible, visit museums, like Old Sturbridge Village in Massachusetts, that feature reenactments of early American life. Check out websites like Kovels that deal solely with antiques. Talk with dealers, preferably those who specialize in Windsor chairs. Inspect the chair. A true Windsor chair, whether straight-back or rocker, can be identified by its construction. Old Windsors were called "stick-back" chairs because they had sticks, or spindles, driven through a solid plank seat to form legs. These same spindles also extended above the seat to connect with the wooden hoop that was the chair's back, as well as forming the arm supports. Chairs constructed like this didn't require screws or nails to hold them together. A Windsor rocker, however, required that holes be bored in the rocker to accommodate the chair legs. Often, more spindles and a thicker seat mean an older chair. Old Windsor rockers were made of a variety of woods, often in the same chair. To disguise this, they were almost always painted. Dark green and black paint were commonly used. If the chair has a clear or waxed finish, it may either be new or has been stripped and refinished. Windsor rockers with clear finishes were very rare. Look for signs of age. An old Windsor rocking chair will show the signs of use that come with age. If the chair is painted, the paint may be crackled or peeling and even worn through to the bare wood in spots. There may be more than one layer, indicating it has been painted many times over the years. Check the arms, seat and back, where a person's body would have rubbed. On an old chair, these areas will be worn with a smooth patina that only comes with age. Turn the chair over and examine the rockers. On an old chair, the rocker bottoms may be worn through to the bare wood and the curve slightly flattened, making the chair rock unevenly. Hire an appraiser. There are many artful Windsor chair reproductions available today. Only an expert will be able to tell you definitively whether a chair is old or not. You can find a reputable appraiser through professional appraisal organizations like the National Association of Professional Appraisers.